If you have French style doors to your sun porch or any type of double doors you’ll want to use double door seals to cover the gap that can occur where two doors meet. 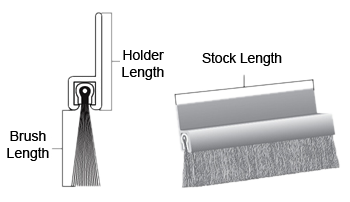 Using brush weatherseal will help keep the inside comfortable regardless of the weather outside. Please note; colors may vary depending on your monitor, all holders are not available in all colors, brush filament (sometimes called bristles) are black. No customization available. Installing our product is simple and requires only a few tools. Check out our Guides Section for more information.